(Nanowerk News) Computer vision algorithms that enable Samsung’s latest humanoid robot, Roboray, to build real-time 3D visual maps to move around more efficiently have been developed by researchers from the University of Bristol. By using cameras, the robot builds a map reference relative to its surroundings and is able to “remember” where it has been before. The ability to build visual maps quickly and anywhere is essential for autonomous robot navigation, in particular when the robot gets into places that have no global positioning system (GPS) signals or other references. 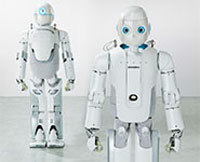 Roboray Roboray is one of the most advanced humanoid robots in the world, with a height of 140 cm and a weight of 50 kg. It has a stereo camera on its head and 53 different actuators including six for each leg and 12 for each hand. The robot features a range of novel technologies. In particular it walks in a more human-like manner by using what is known as dynamic walking. This means that the robot is falling at every step, using gravity to carry it forward without much energy use. This is the way humans walk and is in contrast to most other humanoid robots that “bend their knees to keep the centre of mass low and stable”. This way of walking is also more challenging for the computer vision algorithms as objects in images move more quickly. The Bristol team, who have been collaborating with Samsung Electronics in South Korea since 2009, was in charge of the computer vision aspects of 3D SLAM (simultaneous localisation and mapping). Dr Walterio Mayol-Cuevas, Deputy Director of the Bristol Robotics Lab, Reader in the Department of Computer Science at the University of Bristol and leader of the team, said: “A humanoid robot has an ideal shape to use the same tools and spaces designed for people, as well as a good test bed to develop machine intelligence designed for human interaction. Dr Sukjune Yoon from the Samsung Advanced Institute of Technology (SAIT), speaking about the collaboration with the University of Bristol, said: “Bristol’s visual SLAM and their other real-time visual technologies have been very beneficial for Samsung Electronics’ humanoid robot project. The technology of rapid 3D visual mapping, developed at Bristol, is internationally renowned because of its ability to robustly track and recover from rapid motions and occlusions, which is essential for when the humanoid moves and turns at normal walking speeds. This Bristol work has been used for a number of applications outside robotics too, from augmented reality to commercial applications in the analysis of wearable Gaze data. A paper describing some aspects of this collaboration with Samsung is published in the journal Advanced Robotics ("Real-time 3D simultaneous localization and map-building for a dynamic walking humanoid robot").